Continuing my The Body Shop review trilogy (read two other here and here), for this last part I'll give a review of The Body Shop Moisture White Shiso 2in1 Brightening Eye Cream. Such a mouthful name, from this moment forward I'll just call it The Body Shop Shisho Eye Cream. I don't know what happened to me but I feel like these past few months my under eye area is getting a little bit darker than usual. I'm sure I have enough sleeping time. Maybe lack of vegies? Does that affect under eye color? I don't think so. Hahaha. Whatever it is, I feel the need to brighten my under eye area so my face look fresher even without the help of some concealer. Thank God The Body Shop Shisho Eye Cream is one of the product that was in the goodie bag at The Female Daily & The Body Shop Mini Blogger Workshop. A dual action cream that brightens eye area and improves darkened skin. The premium micro-circulating massager stimulates circulation to reduce signs of fatigue. Contains Shiso extract and Community Fair Trade organic aloe. Suitable for all skin types. The product housed in a matte plastic tube with metal applicator. Tube is totally my favorite kind of packaging. If you read some of my posts, you must have already known my love for tubes. If you're new here, I'm telling you why. Upside-down tube makes the product sits near the opening so it's easier to get the product out of the packaging. The metal massager is something unique and I've never seen any other product like this before. It has a little hole on the center where the actual cream go through. So basically I just need to squeeze the tube a bit until I have desired amount of cream out and then apply it to my eye area using the metal tip. The tip is cold so it's really refreshing especially when it's mid-day and my eyes are tired from looking at the computer for too long. I wanted to say I love the applicator but there's something that holds me back. The metal tip needs to be cleaned after every single use. It'll get gross if you don't clean it everytime. Me being an ultimate lazy baby, I just want to slather the product to my skin and then throw it to my bag. The cream is very creamy, not too thick, not too thin. It's a really nice cream consistency that spreads smoothly and makes the applicator glides easily. It needs time to absorb but nothing too disturbing and it hydrates my under eye area well. For the performance of The Body Shop Shisho Eye Cream, I have to say that it's just refreshing. I don't find my under eye brighter. It doesn't do miracle for me. For the price, I'm quiet disappointed with the performance. Makeup primer is something important but yet I don't always use primer whenever I use makeup. Most of the time I forgot to use the primer, other time I feel too lazy to add another step to my makeup routine, and other time I just don't have the time to put the primer because I'm a crazy procrastinator that thinks that I can finish my makeup in 10 mins while actually I totally can't. When I use primer, my favorite kind is the ones that contain silica. I have big pores on the sides of my nose and silica-based primer can fill the pores so they're temporarily gone hehe. I have the famous Benefit's Porefessional primer. It does the job well but one thing that holds me back from buying the full size product (the one I have is the travel size one that came from How to Look the Best at Everything kit) is the price. I believe it's more than Rp400.000 now? For me it's too much for something I don't use daily. The tube is sophisticatedly colored in black, white, and silver. I really like the design. The mouth is on the bottom so the product is always near the exit way and that makes it easier to get the product out. The cap is screw-type cap. I prefer flip cap as it's easier to open but screw cap is more secure for travelling. This all-new face perfector blurs imperfections, giving you flawless photo-perfect skin in an instant! With Community Fair Trade marula oil. I say yes to the shine control, pore appereance, and makeup extending. But for blemish hiding and complexion unifying I'm sorry I don't think The Body Shop All-in-One Instablur does those jobs. The product itself is clear and transparent (hence the universal shade). This is why I said it's not for blemish hiding and complexion unifying because this product definitely gives zero coverage. The application is a bit tricky. You need to smooth the product on your skin and be careful not to massage it. It's because The Body Shop All-in-One Instablur fills your pores and creates a layer on top of your skin to make it as smooth as baby's bum. If you massage when you apply it, you'll ruin that layer and be left with messy white dirt and unprimed skin. But aside from that, The Body Shop All-in-One Instablur is a really good makeup primer. The website says you can use it alone or as a makeup primer. I don't see much difference on my skin when I use it alone (only the mattifying effect) so I'd always go for Instablur as a makeup primer. I can feel that this primer controls the sebum on my face so I don't get too oily at the end of the day which extends the makeup wear time and also it fills the big pores so my skin looks flawless. SUPER LOVE. Hola Amigo!! It's been a while since my last post, eh? It's been a quiet busy month for me and add that with my laziness, you can conclude yourself why I've been MIA for the last few weeks. As you've already read my skincare routine before (if you haven't, where have you been?? Click here to read and then go back to this post), I use The Body Shop Nutriganics Drops of Youth as my pre-serum. I got this bottle from Female Daily workshop a few months ago and use it ever since. Drops of Youth is designed to optimise the results of your daily Nutriganics regime. It contains criste-marine plant stem cells and beech bud extract, known to help enhance surface skin renewal. Drop by drop, it evens skin tone and leaves skin looking smoother, fresher and healthier. What I like the most from the packaging is the dropper because instead of the traditional pipette we used to see, The Body Shop Nutriganics Drops of Youth have this unique pump. So I just need to press the pump once and then the product will fill the dropper. To release the product, I just need to press the pump once again. The instruction says to use 2-3 drops for the whole face and neck. I just use 1 drop for daily usage. When I feel my skin needs more care, I use two. I put a drop on my palm, rub my palms to spread the product, and then I massage the product to the skin. The consistency is liquidy but not too runny. It's a bit gel-like. I can't describe scents very well but for me it smells fresh, green, a lil bit herb-y, and I also can smell the alcohol a bit. My skin feels matte, fresh, and hydrated everytime I use this. I use my serum and moisturizer afterwards. The Body Shop Nutriganics Drops of Youth absorbs very fast to the skin so I don't have to wait too long to use the serum and moisturizer. - The smell. But I think it's personal preference after all. For this year's holiday season, Kiehl's teamed up with duo artist Craig&Karl to make a limited edition collection. 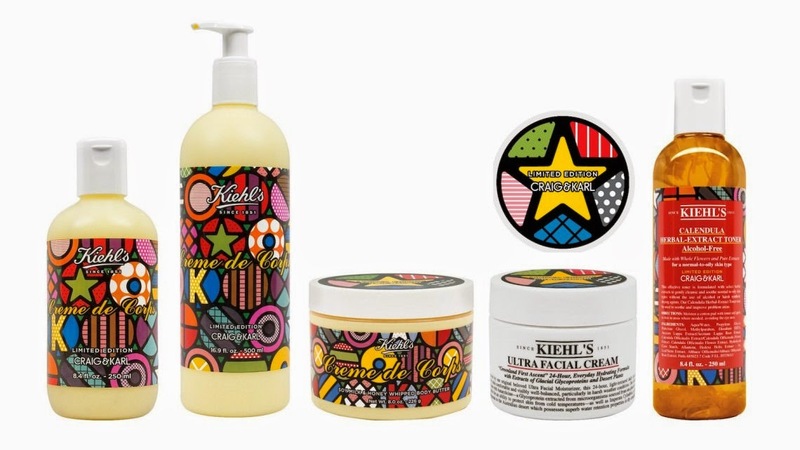 Kiehl's x Craig&Karl Holiday Collection includes Creme de Corps Body Lotion, Creme de Corps Body Butter, Ultra Facial Cream, and Calendula Herbal-Extract Toner. "Hi, we're Craig Redman and Karl Maier, we live in different parts of the world but collaborate daily to create bold work that is often filled with simple messages executed in a thoughtful and humorous way." Today I'm gonna share my skincare routine. I recently added some products to my skincare regime so I thought I'll write about it. I use the same products for day and night, may add a product or two at night but they don't count as a routine. Bought this because I had a breakout trying a new moisturizer. I've tried Clean&Clear Essentials Moisturizer before and as far as I can remember it's good to my skin so I bought this to replace that new moisturizer. This moisturizer claims to be oil-free and won't clog pores. I have oily skin so it suits my need for being oil-free. The texture is gel-like and it absorbs quickly. It gives enough hydration for me and doesn't break me out. My skin got back to the usual condition after I use this moisturizer. To fasten the process of banishing pimple-like creature on my face, I use this toner after I washed my face. It contains quiet high level of alcohol but I don't mind with that. Clean&Clear Essentials Oil-Control Toner helps to remove the remaining dirt on my face. Because my breakout has been resolved, I don't use this toner daily anymore. I only use it when I have occasional zit to help the pimple dry quicker. This one is the travel size product I got when I bought the full size bottle. I used the travel size first because I want to know how my skin reacts to the product. I'm on my big bottle now. This serum (or concentrate) is really worth the price. The full size is priced at IDR 1 million for 30ml. Right after I spread the serum all over my face, I can instantly feel the difference. It absorbs very fast but not too fast until you need to rush to spread and it makes my skin matte and firm. I've used Lancome Advanced Genifique more or less a month now and I can tell my skin is better than before. Too bad I didn't take before picture so I can't make before-after comparison. If you're thinking of buying this, I say buy it! Got this bottle also from buying the Lancome Advanced Genifique. The applicator fascinates me so much. It has a pearl-like applicator and it's cold so it's refreshing when you apply the product under your eyes. I swipe a little product at a time and blend it with my finger. I haven't see any major change on my under eye area but that could be my fault too for not having enough sleep. The main reason I bought this facial foam is because it's on sale hahaha I was in Korea and saw this facial foam discounted, it was around $3 I believe.. So I bought it without knowing a single thing about it. I use The Face Shop Peach Herb Day 365 Cleansing Foam with my Clarisonic Mia almost everyday. I use only a little bit because it produces quiet a lot of foam and it's harder to control the foam when I use Clarisonic. It's ok. Nothing too amazing. It cleans my skin nicely and doesn't make my skin feel tight. This facial foam lasts me more than a year. I switch foams sometimes, tho.. But most of the time I use this. Three bucks for more than a year, what do you think? But whatever, baby, I purchased it and I'm going to finish it. The consistency is like thicker gel, it doesn't sink right after I apply it. I can even see some shine under my eyes after a minute or two. It takes time to be absorbed but I don't have a problem with that because I mainly use this at night, after I use my Lancome Genefique Yeux Light-Pearl. It's a current acquisition because my face is kinda dehydrated. My skin is oily but lacking of water. I use this spray after I tone my face. Let my skin drink it for a while and then I'll continue to The Body Shop Nutriganics Drops of Youth. Basically Evian Facial Spray is just mineral water in a spray can so don't expect too much. I also use this after I finished my makeup when I feel my face look too powdery. The water will make the makeup look softer and more natural.